Collectable items spanning the halcyon years of the space program. genuine and guaranteed with certificates of authenticity. Enquiries welcome. This wonderful presentation houses a piece of Heat shield from the Apollo 12 mission. The image shows Astronaut Alan L. Bean, lunar module pilot, traverses with the two sub packages of the Apollo Lunar Surface Experiments Package (ALSEP) during the first Apollo 12 extravehicular activity (EVA). Bean deployed the ALSEP components 300 feet from the Lunar Module (LM). The LM and deployed erectable S-band antenna can be seen in the background. The Heat shield was sourced from Threehook Aviation. Apollo 12 was the sixth manned flight in the United States Apollo program and the second to land on the Moon (an H type mission). It was launched on November 14, 1969 from the Kennedy Space Center, Florida, four months after Apollo 11. Mission commander Charles “Pete” Conrad and Lunar Module Pilot Alan L. Bean performed just over one day and seven hours of lunar surface activity while Command Module Pilot Richard F. Gordon remained in lunar orbit. The landing site for the mission was located in the southeastern portion of the Ocean of Storms. This wonderful presentation houses a piece of parachute that was deployed upon the final stages of descent during the Apollo 13 mission. The image shows a view of the severely damaged Apollo 13 Service Module (SM) was photographed from the Lunar Module/Command Module (LM/CM) following SM jettisoning. As seen here, an entire panel on the SM was blown away by the apparent explosion of oxygen tank number two located in Sector 4 of the SM. Two of the three fuel cells are visible just forward (above) the heavily damaged area. Three fuel cells, two oxygen tanks, and two hydrogen tanks are located in Sector 4. The damaged area is located above the S-Band high gain antenna. Nearest the camera is the Service Propulsion System (SPS) engine and nozzle. The damage to the SM caused the Apollo 13 crew men to use the LM as a “lifeboat.” The LM was jettisoned just prior to Earth re-entry by the CM. The Parachute was sourced from Threehook Aviation. This wonderful presentation houses a piece of parachute line that was deployed upon the final stages of descent during the Apollo 7 mission. The image shows the expended Saturn IVB stage as photographed from the Apollo 7 spacecraft during transposition and docking manoeuvres. St. Louis Bay and Lake Borgne area just east of New Orleans is seen below. The round, white disc inside the open panels of the Saturn IVB is a simulated docking target similar to that used on the lunar module for docking during lunar missions. The parachute line was sourced from Paul Hartunian who purchased the material in the October 26, 1996 Superior Auction. This wonderful presentation houses a piece of Thermal Foil Tape from the Apollo 8 mission. The image shows an oblique view from the Apollo 8 spacecraft looking eastward across the lunar surface from about 115 degrees east longitude to the horizon near 180 degrees east longitude. The crater Tsiolkovsky in the center of the picture is 150 kilometers wide and is located at 129 degrees east longitude and 21 degrees south latitude. While in lunar orbit, Apollo 8 moved toward the camera position over the terrain along the left (north) side of this photograph. The Thermal Foil Tape was sourced from Threehook Aviation. This wonderful presentation houses a piece of Honeycomb Heat shield from the Apollo 9 mission. The image shows a view of the Apollo 9 Lunar Module (LM), “Spider,” in a lunar lading configuration, as photographed from the Command and Service Modules (CSM) on the fifth day of the Apollo 9 Earth-orbital mission. The landing gear on the “Spider” has been deployed. Inside the “Spider” were astronauts James A. McDivitt, Apollo 9 commander; and Russell L. Schweickart, lunar module pilot. Astronaut David R. Scott, command module pilot, remained at the controls in the Command Module (CM), “Gumdrop,” while the other two astronauts checked out the LM. The Honeycomb Heatshield was sourced from Threehook Aviation. Apollo 9, was the third manned mission in the United States Apollo space program and the first flight of the Command/Service Module (CSM) with the Lunar Module (LM). Its three-person crew, consisting of Commander James McDivitt, Command Module Pilot David Scott, and Lunar Module Pilot Rusty Schweickart, tested several aspects critical to landing on the Moon, including the LM engines, backpack life support systems, navigation systems, and docking maneuvers. The mission was the second manned launch of a Saturn V rocket. This presentation depicts the STS-30 lifting off from the launch pad. STS-30 was the 29th NASA Space Shuttle mission and the fourth mission for Space Shuttle Atlantis. The mission launched from Kennedy Space Center, Florida, on 4 May 1989, and landed four days later. During the mission, Atlantis deployed the Venus-bound Magellanprobe into orbit. Space Shuttle Atlantis lifted off from Pad B, Launch Complex 39 at Kennedy Space Center (KSC), Florida, at 14:48 EDT on 4 May 1989. The primary payload, the Magellan spacecraft with its attached Inertial Upper Stage (IUS), was successfully deployed later that day. STS-30 was the first American planetary mission in 11 years. The launch was originally scheduled for 28 April, the first day of a 31-day launch period when Earth and Venus were properly aligned. This presentation depicts the Space Shuttle Endeavour rising above the Earth. STS-77was the 77th Space Shuttle mission and the 11th mission of the Space Shuttle Endeavour. The mission began from launch pad 39B from Kennedy Space Center, Florida on 19 May 1996 lasting 10 days and 40 minutes and completing 161 revolutions before landing on runway 33. NASA‘s flight of shuttle Endeavour was devoted to opening the commercial space frontier. During the flight the crew performed microgravity research aboard the commercially owned and operated SPACEHAB module. The mission also deployed and retrieved the Spartan-207/IAE (Inflatable Antenna Experiment) satellite and rendezvoused with a test satellite. This presentation depicts the Space Shuttle Columbia sitting ready on the launch pad. STS-80 was a Space Shuttle mission flown by Space Shuttle Columbia. The launch was originally scheduled for 31 October 1996, but was delayed to 19 November for several reasons. Likewise, the landing, which was originally scheduled for 5 December, was pushed back to 7 December after bad weather prevented landing for two days. The mission was the longest Shuttle mission ever flown at 17 days, 15 hours, and 53 minutes. Although two spacewalks were planned for the mission, they were both canceled after problems with the airlock hatch prevented astronauts Tom Jones and Tammy Jernigan from exiting the orbiter. Columbia carried into orbit two satellites that were released and recaptured after some time alone. The first was the Orbiting and Retrievable Far and Extreme Ultraviolet Spectrometer-Shuttle Pallet Satellite II (ORFEUS-SPAS II). The main component of the satellite, the ORFEUS telescope, had two spectrographs, for far and extreme ultraviolet. This presentation depicts the Space Shuttle Discovery lifting off from the launch pad. STS-85 was a Space Shuttle Discovery mission to perform multiple space science packages. It was launched from Kennedy Space Center, Florida, on 7 August 1997. The deployment and retrieval of a satellite designed to study Earth’s middle atmosphere along with a test of potential International Space Station hardware highlighted NASA’s sixth Shuttle mission of 1997. 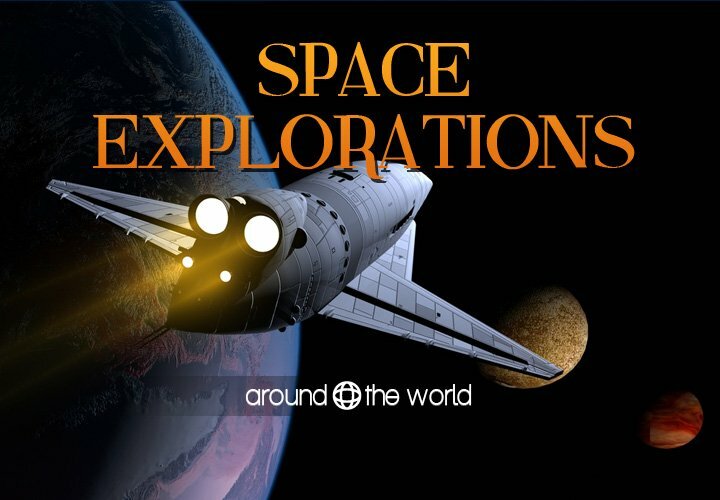 This wonderful presentation houses real space flown materials from the Space Shuttles Endeavour, Atlantis, Discovery, Columbia and Challenger. The image is a beautiful view of Earth as seen from the Cupola on the Earth-facing side of the International Space Station. In the top left foreground is the Russian Soyuz crew capsule and on the lower right corner, a solar array panel can be seen. Space Shuttle Challenger: The attached Insulation Blanket is from the STS 41-G mission. STS 41-G was the 13th flight of NASA’s Space Shuttle program and the sixth flight of Space Shuttle Challenger. Challenger launched on 5 October 1984, and conducted the second shuttle landing at Kennedy Space Center on 13 October. It was the first shuttle mission to carry a crew of seven, including the first crew with two women (Sally Ride and Kathryn Sullivan), the first American EVA involving a woman (Sullivan), and the first Canadian astronaut (Marc Garneau). STS-41-G was the third shuttle mission to carry an IMAX camera on board to document the flight. Film footage from the mission (including Sullivan and David Leestma’s EVA) appeared in the IMAX movie The Dream is Alive. The material was removed from the shuttle after its flight. Space Shuttle Endeavour: The attached Insulation Blanket is from the STS-77 mission. STS-77 was the 77th Space Shuttle mission and the 11th mission of the Space Shuttle Endeavour. The mission began from launch pad 39B from Kennedy Space Center, Florida on 19 May 1996 lasting 10 days and 40 minutes and completing 161 revolutions before landing on runway 33. The material was removed from the shuttle after its flight. Space Shuttle Atlantis: The attached Insulation Blanket is from the STS-86 mission. STS-86 was a Space Shuttle Atlantis mission to the Mir space station. This was the last Atlantis mission before it was taken out of service temporarily for maintenance and upgrades, including the glass cockpit. The material was removed from the shuttle after its flight. Space Shuttle Discovery:The attached Insulation Blanket is from the STS-85 mission. STS-85 was a Space Shuttle Discovery mission to perform multiple space science packages. It was launched from Kennedy Space Center, Florida, on 7 August 1997. The material was removed from the shuttle after its flight.